In a world whose centrifugal globalizing powers are stretching the fibers of closely-knit tribal units to breaking point, the final days of December don't just mark a time of stability, but of unity: Having mostly sacrificed its religious meaning in favor of commerce, Christmas, to most, has retained its significance by remaining a family ritual. So it should seem only consequential that Los Romeros should finally record their first Christmas album after half a century at the pole position of the guitar quartet, a genre they have made their own like few others. Not only have they, in musical terms, been billed as the “royal family of the guitar.” Their multigenerational succession model has also proved a potent force for both constant internal rejuvenation and long-term continuity, with new members being recruited exclusively from the family's ranks when the original line-up of Celedonio, Celin, Pepe and Ángel disintegrated. In fact, it has been so successful that even religious newsmagazine The Trumpet recently touted them as a universal example for how the family still represented the essential social core of society in the 21st century. If there were ever an ensemble capable of making you believe in the validity of Christmas again, it would have to be them. Of course, these considerations notwithstanding, the question remains how to add to the vast and still proliferating catalogue of already existing recordings dedicated to the festive season. Today, there are Christmas albums by anyone from Frank Sinatra to Ronan Keating and from Mariah Carey to Jessica Simpson. There are Christmas compilations with an industrial sound-art-edge or a metal flavour (A Metal Xmas and a Headbanging New Year), samplers containing festive performances by synth-pop bands or jazz combos. When I recently visited a friend, she was playing an album entitled A Christmas del Mar, containing chill out electronica versions of tunes like "Silent Night," "Joy to the World" and "Jingle Bells"--a blend so horrifically incongruent and tasteless that we instantly fell in love with it. A plethora of stars from the realms of classical music have also contributed, releasing anything from Christmas adagios (Herbert von Karajan) to Christmastides (Jessye Norman) or, even more to the point, a Celebration of Christmas (Plácido Domingo, José Carreras and Natalie Cole). Adding one album more or less to the canon probably won't do any harm. But, just like presenting yet another rendition of Vivaldi's Four Seasons, it does seem a bit superfluous from the outset. This is why it is all the more remarkable that Christmas with Los Romeros should actually turn out to be a pretty unique project on closer inspection. On the outside, Los Romeros have simply opted for a personal approach. The project sprang from their desire to work with Italian violinist, composer and conductor Massimo Paris, the songs were mainly selected from the pieces they'd play over Christmas at home and later complemented by pieces written in their honor as well as arrangements of popular favorites by close allies like Federico Moreno Torroba. The track list of the album includes delicate miniatures by William James Kirkpatrick („Away in a Manger“) or Mykola Leontovych („Carol of the Bells“) as well as extracts from Handel's Messiah and a twenty-minute X'Mas [sic] Suite for four guitars and chamber orchestra written by Paris. This blend of traditionals, Christmas-related compositions and Baroque pieces would appear so natural that it is hard to believe it has never been tried before. And yet, astoundingly, that seems to be the case - while Karajan's aforementioned album was built around Christmas concertos by the Berlin Philharmonic's former concertmaster Thomas Brandis, almost stereotypically, each new Christmas release has dealt purely with the feast's folk heritage. Add to the fact that seemingly worn-out classics like "Es ist ein Ros' entsprungen (O Come, O Come)“ are presented in subtly, yet significantly reworked renditions, taking well-known originals through suspenseful new key changes, and the collection has more than earned its justification on a market saturated with lovelessly designed products. At the same time, Los Romeros have decidedly not strayed too far from the downtrodden paths. Virtuosity is just as absent from the record as real surprises and taken on their own, none of the performances truly stands out. In the liner notes, Graham Wade writes: "In this context, familiar items (…) take on a new and highly charged significance, the intricate sonorities being presented with appropriately intimate artistry, as well as a sense of spontaneity and freshness." But charged significance, spontaneity and freshness are the very last terms you'd associate these interpretations with. It would appear, at times, that all involved are contrarily taking great care not to draw too much attention to their performance. 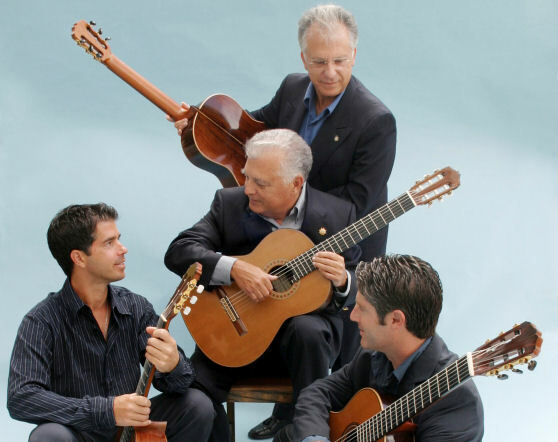 Mostly, this is down to the combination of classical acoustic guitars with the chamber sound of the Concerto Málaga, an instrumental fusion in which both sides need to take care not to overwhelm the other and in which the Romeros are, somewhat against the odds, frequently an integral part of the ensemble rather than excelling as soloists. While this should seem perfectly fine in principle, it does beg the question why, precisely, some of these compositions should have been re-scored for a guitar quartet if one is frequently hard pressed to distinguish individual instruments from the tight group sound. As rationally appealing as these reservations may be, they are ignoring an all-essential aspects: Not only is Christmas reinforcing family ties, but turning everyone into a child again. And so, a celebrational album of this sort needs to address entirely different needs and sensibilities. Does it matter, to a child's ears, that Handel's Messiah is actually rather a piece dedicated to Easter than Christmas? That there are already thousands of versions of both Gounod's and Schubert's "Ave Maria" available? Or that, strictly speaking, one would wish for more nuances and a little more risk on plenty occasions? In reality, none of these things matter when you're drinking cinnamon tea with your loved ones or dressing up the tree. The value of a Christmas album can not be decided by the cool cerebrals of a critic, but only by putting it on repeat and immersing oneself fully in it. 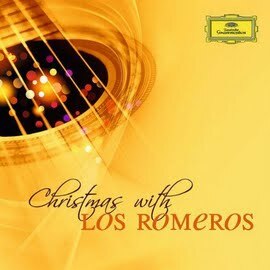 In this sense, Christmas with Los Romeros reminds one of what a Christmas album should really be. It is about the functional and the spiritual becoming one. It is all about tone, timbre and atmospherics, the entire production of the CD being bathed in the same honeycombed golden warmth as the cover. And virtuosity, surprises, suspense, spontaneity and freshness aren't missing by means of accident, but conscious deliberation. Rather than trying to outshine the others, every musician is trying to add to the group sound as an open reference to the spirit of unity. To mark the occasion, founding member Ángel, who left the group to concentrate on his solo career in 1990, has returned, turning the ensemble into a quintet for once. As his brother Pepe put it, it would simply have been inconceivable to celebrate without him. If statements like this seem silly or pathetic to you, then this album should not be part of your collection. Editor in chief of Germany’s largest print publication on recording, Beat, and a regular contributor to the New Zealand-based arts magazine White Fungus.